The 3D printer world is heating back up. Just last month MakerBot introduced a new pair of Replicator machines and now Ultimaker is following suit with the Ultimaker 3. The headlining feature of the Ultimaker 3 is its the company's first 3D printer with a two extruders that allows it to create objects with a complex composition and geometry. The dual head enables users to create intricate objects made of a mixture of materials such as Nylon and dissolvable PVA – plus it opens up mixing two colors as well. Ultimaker claims it has improved on the dual extruder design with two printing heads that can be set at different heights. It's also easier to switch out materials by quickly changing out the reels on the back of the machine and switching out the printer cores. On top of the new extruder, the printing bed is built with actively leveling bed mechanism designed to help prevent and correct printing mistakes. 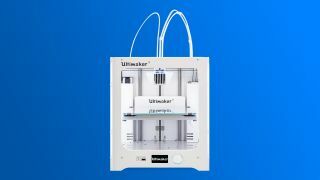 Ultimaker has also expanded the connectivity of its 3D printer beyond simply connecting it to Wi-Fi. It can use NFC technology to identify smart materials, meanwhile, a built-in webcam allows users to remotely monitor print output through the open-source CURA software. The Ultimaker 3 is available starting today, but its heady $3,495 price tag might dissuade all but professionals who require a high-end 3D printer of this caliber.